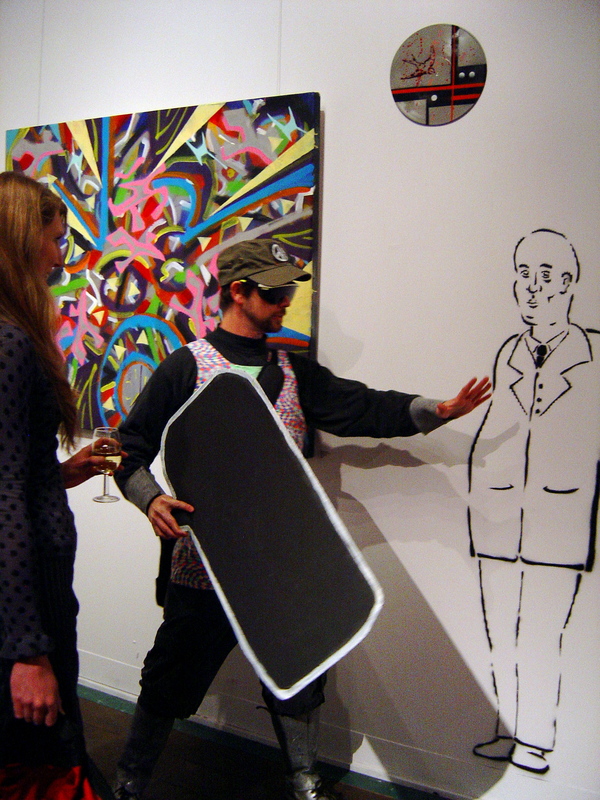 On Friday night there was an opening at Brunswick Arts Space, an artist-run-space. In the main gallery there is a group exhibition, “Desire Lines” with thirty-five works by Jo Waite, Leon Van De Graaff, Alex Clark, Martin Nixon, Jess Parker, Sarah Howell, David Blumenstein, Michael Fikaris, and many other artists. ‘Desire lines’ are informal paths that people make to get where they want to go. The exhibition was mix of contemporary art, psychogeography, illustration, comics and zines that all remember and record Brunswick. It might sound like an odd mix but the local details illustrations of the suburb in the pages of comic books are a rich vein of psychogeographical research. 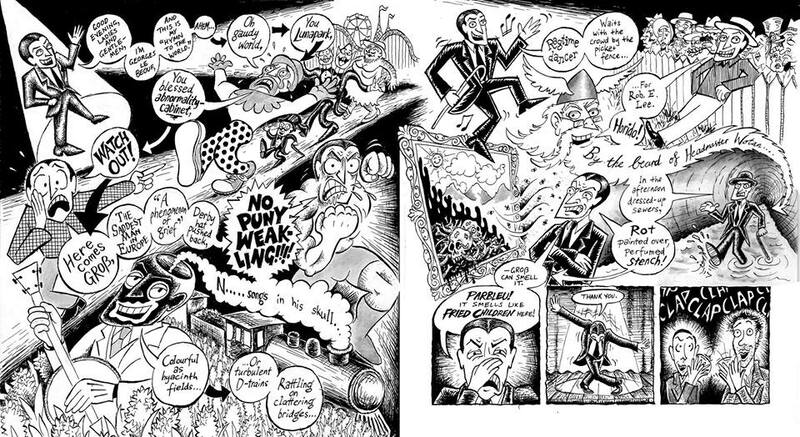 There is a whole wall of art work for comic books that illustrate this point, like Martin Nixon’s “The way to the entrance to the entry to Squishface” (Squishface is an open comic artists studio in Brunswick). Melbourne underground comics have a long tradition of mapping the city, going back to, as far as I can remember, Yell Olé! by Brendan Tolley and Bernard Caleo where the heroes battled the architecture of the city. The most comprehensive and democratic map of Brunswick ever constructed. 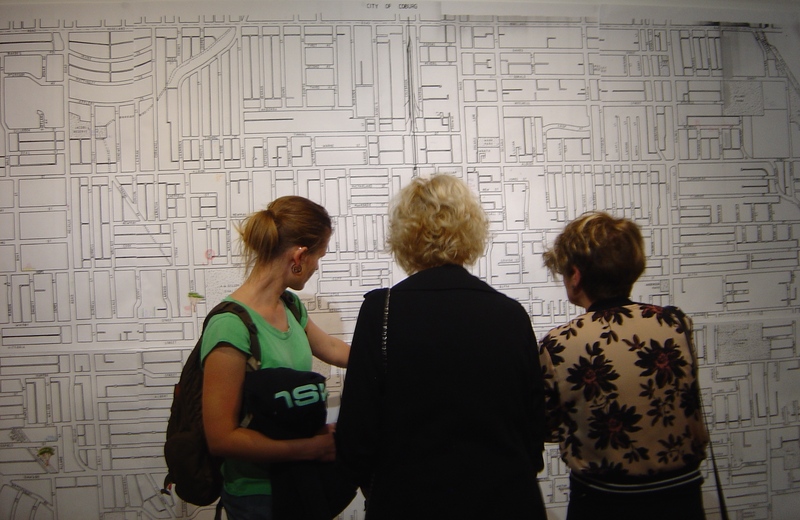 At the opening the focus of attention and discussion was an open collaboration on a wall sized map of the suburb: “The Most Comprehensive and Democratic Map of Brunswick Ever Constructed.” Everyone at the opening was writing and drawing on it, adding their landmarks and details. The local artists are aware how much Brunswick is changing as apartment blocks are built around the gallery in the former factory space. It was good to see Victor Gris, the curator of the Counihan Gallery in Brunswick, at the opening, not just personally but also that he is engaged with the local art community. In the upstairs gallery was Denise Hall’s series of five paintings “Creature”. Hall’s expressionist paintings with a limited palette have been torn apart and reassembled, like the butchered meat they depict. Often public murals can look naff, too politically correct or otherwise too preaching they look like a school guidance councillor has designed them. Part of the grand socialist tradition of public murals promoted by the Mexican mural painters. Or simply decorative. But the comic book murals in Brussels escape these hazards because they are not propaganda for products nor ideas; they are just having fun with established comic book images. So the impact of these comic book murals is different from other public murals; there is no didactic function to them, they are simply fun. Belgium invented the comic book, along with French fries, shopping malls, art nouveau and a lot of other things that have made the modern world. Belgians are particularly proud of their comic books as demonstrated by the city’s many comic book shops, it’s statues of comic book characters and public murals of enlarge comic book panels around Brussels inner city. 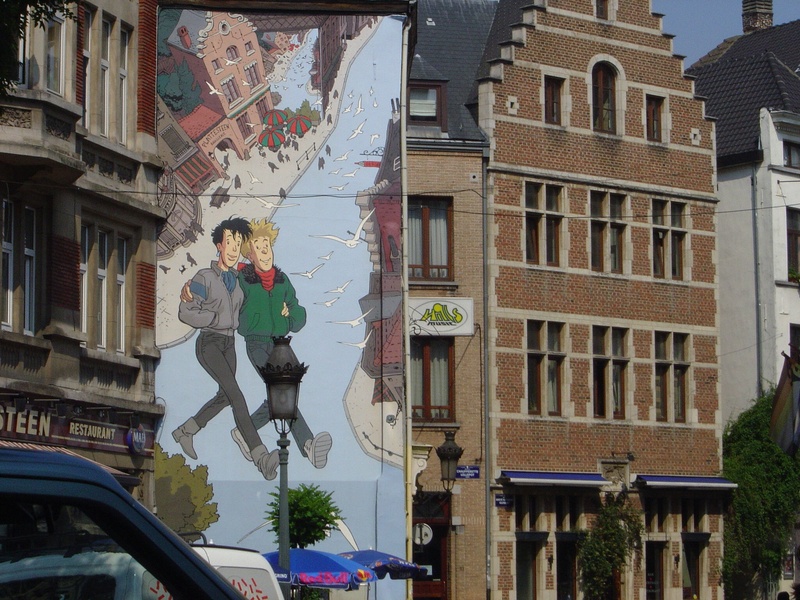 The justification for these murals on the basis of Belgium nationalism is thin; the population and visitors to Brussels enjoy the comic books. 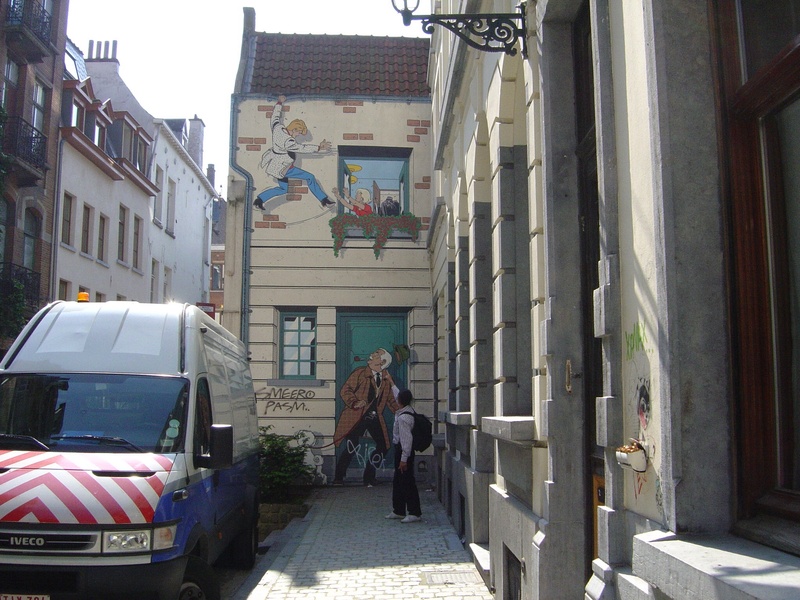 The Brussels Comic Strip Route was created by the comic strip museum by Michel Van Roye, Brussels Councillor for Urban Development and the Environment, in 1991. 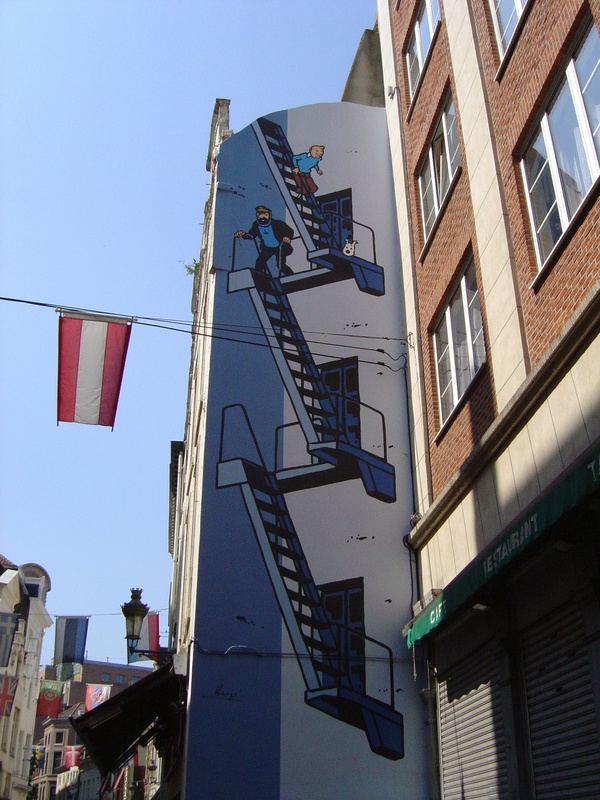 It is an on going project and new murals are being added, form posts on a “comic strip route” around Brussels. 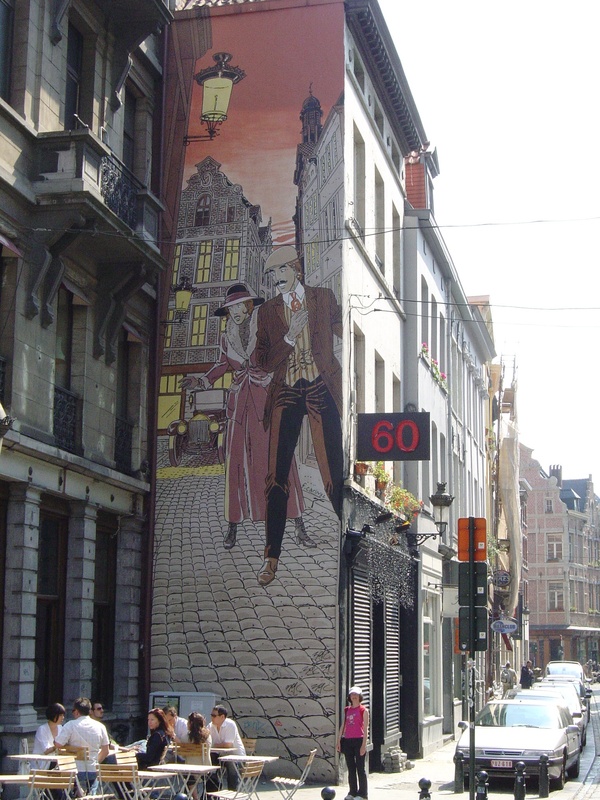 The murals are encountered as surprising, engaging and entertaining aspects of Brussels. One reason for the success of the murals is that the murals are not placed on urban eye-soars in an attempt to ameliorate their ugliness; rather they are placed on suitable walls around the city where they compliment the urban scene. Comic book images frequently depict the urban environment and comic book design works with the architecture of the city. Frequently the murals employ tromp l’oeil elements integrates the image with the building. 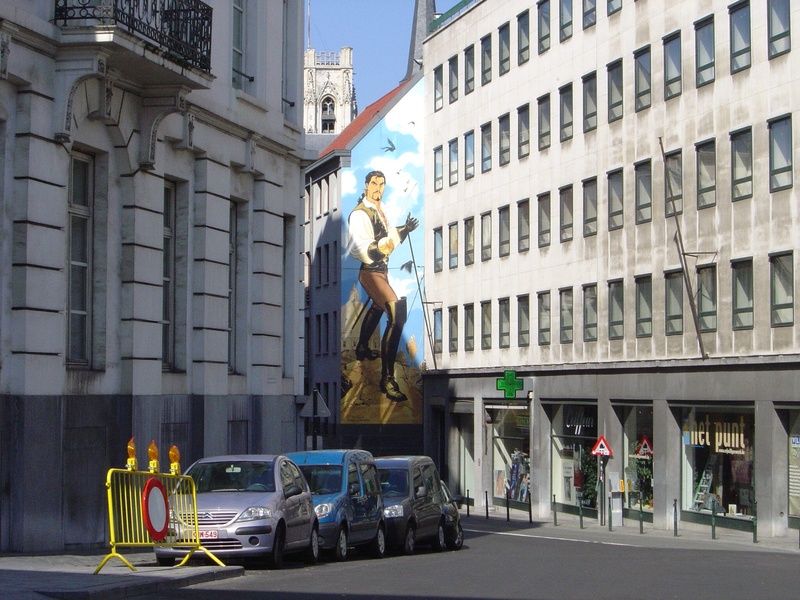 Public art tributes to Belgium comic books do not stop at these murals; there is a comic book museum, the Belgium Comic Strip Centre, in a fantastic art nouveau building designed by grand master of Art Nouveau, Victor Horta in 1906. There is also a very large sculpture of a duo of comic book characters making a colourful and light-hearted splash in the business district of Brussels. In #2 the narrative has changed from Herzfelde being the narrator to Grosz being the central character and Herzfelde’s brother becomes John Hartfield. For like George Grosz’s costume changes the Dadaists were often changing their names, working under different names or living under false names; their identities were mutating. Who were the Dadaist exactly? Avant-garde cabaret act, radical artists, publishers, medical students every time you look they change into something else. If the Dadaists were alive today what would they be doing? Bands, zines… would they even be together at all? Given that the Dadaists appear to be a disparate bunch of hippies (Hans Arp & Hugo Ball), punks (Richard Hulsenbeck), new agers, goths, head-bangers (Max Ernst’s nickname was “Metal Head”) and other, perhaps, yet unclassified freaks. Back at the beginning of the 20th century there was still too few of any of them to bother with such classifications. However in retrospect the classifications appear clearer. “Freaks” that very 60s word, comes from back in a time when they were still working out the identity of some of these youth tribes. In The Many Faces of George Grosz Grosz is presented as an unclassifiable freak, a proto-Dadaist. Dada history was made for comic books, the conjunction of text and images. What I dislike about many comics, including this graphic novel, is the way that story is drawn out, it worse than watching a TV series because the wait is longer. Now two years later #2 has arrived – will #3 be finished in time for the centenary of Dada? A century later it is worth re-examining Dada and the Dadaists. This week at the Sweet Streets festival of urban and street art there was the exhibition opening at Brunswick Street Gallery. My mind was on preparations for the Thursday film night for most of the week. Organizing the film night has been my public bit of the festival, aside from all the secretarial duties and other little things. (My interest in the Sweet Streets festival has been stated.) I have only heard about the workshops and the live spraying events going on during the festival. On Wednesday at 1000 Pound Bend a large temporary wall was being undercoated in preparations were being made for Secret Wars. Secret Wars, for those who don’t know, is two street artists covering several square metres of black wall in competition with each other and in front of a paying audience. It was not officially part of the Sweet Streets festival but 1000 Pound Bend had booked it in for Wednesday night anyway. Wednesday night was also the opening of Sweet Streets exhibition on the top floor of Brunswick Street Gallery. It was part of their “Urban Art” series of exhibitions (see my review of previous exhibition in the series). Although Tessa Yee curated both the Sweets Streets exhibitions at 1000 Pound Bend and Brunswick Street Gallery the exhibitions are a distinctly different. Under the broader category of “urban art” this exhibition has more illustration, comic book, photography and stencil art. It is a broad category that includes everything from Heesco’s fantasy illustrations to Debs aerosol paintings. But the street was not far away, even in, Jo Waite’s paintings of four panel comic strips that showed a vision of Melbourne with Spanish instead of English graffiti in the background. Bandos Earthling made an appearance in costume, carrying a large blank speech bubble made of cardboard and posing for photographs (I’m meant to catch up with him sometime during the festival). There were also some small Ben Howe’s stencils at the foot of the stairs at Brunswick Street Gallery. Last year Howe was highly commended emerging artist in the 2009 Melbourne Stencil Festival’s award exhibition. Besides my own biased view you can read what other bloggers wrote about Sweet Streets. James Donald writes a long thoughtful researched review of the Award exhibition and The Earth Died Screaming has some bad iphone photos of the Award exhibition opening. 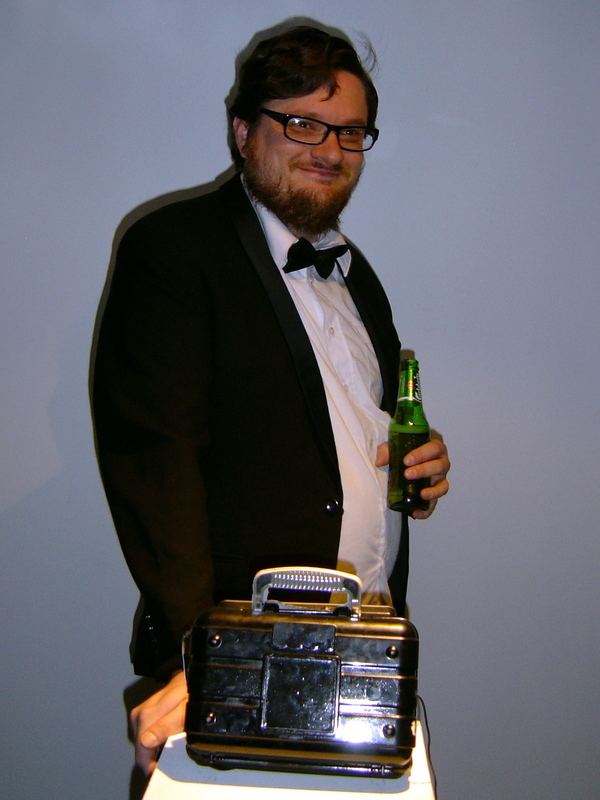 Images to Live By wrote about Dscreet’s film “Dots” at the festival’s Thursday Film night. And Invurt wrote about Sweet Streets@BSG & Secret Wars.